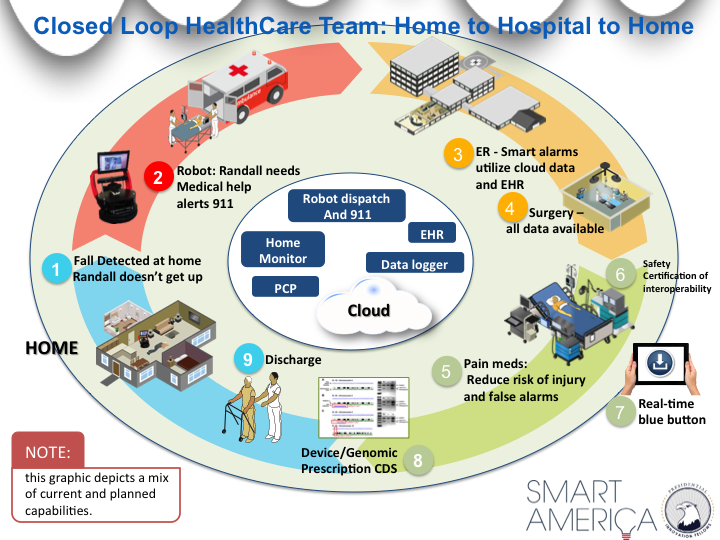 Earlier this month, Professor Marjorie Skubic of the MU College of Engineering presented the idea of the closed loop healthcare system at the Smart America Expo in Washington, D.C.
“We wanted to connect up what we’re doing in the home with some of the activity that’s happening in the hospital in connecting medical devices together,” Skubic said. The closed loop system starts at a patient’s home. A suite of sensors that are embedded into the environment constantly evaluate things like respiratory rate and movement patterns. If the patient falls, the sensors can detect it and automatically send for help. When the patient arrives at the ER, doctors have access to not only their traditional medical record, but a video of the incident as well as a record of their normal heart rate, respiratory rate and other vitals that the system has been tracking at home. As the patient receives care from different specialists or physical therapists, a detailed digital account of their health and treatments travels with them easily. When the patient is ready to return home for recovery, additional sensors can be installed or existing systems updated to look for certain behaviors. If the patient begins to relapse, their doctors receive alerts so another incident can be avoided. The ultimate goal of the closed loop system is to prevent hospitalizations by detecting symptoms before they become a problem. The only issue with the closed loop system is that hospitals and other treatment facilities don’t have the technology to support it. Many facilities store patient’s records electronically, as now required by the American Recovery and Reinvestment Act, but very little of this data is shared among different doctors and specialists. Even though the closed loop healthcare system is still only a concept, Skubic and Marilyn Rantz, a professor at the Sinclair School of Nursing have almost perfected the system of in-home sensors. Skubic and Rantz began developing the system back in 2005 when they installed the first sensors at TigerPlace, an assisted living facility in Columbia. “It’s essential that you have an electronic health record that talks to the sensors to help the healthcare providers make good decisions,” Rantz said. Rantz said nurses at TigerPlace have been able to detect and treat many patients, including one woman who was treated for congestive heart failure before her doctor had detected even the earliest symptoms. And now the two researchers are ready to commercialize the system. “Our commercial partner, Proactive Sense, has been working hard to make these systems as inexpensive as possible so that they can be in private homes,” Skubic said. But Skubic cautions the closed loop system won’t take off until healthcare professionals start to think of a patient’s record as more than just a file in their office.